Scientists at ICRISAT-India were encouraged to focus on developing high-Zn sorghum lines for processed foods and also sorghum varieties as forage with higher digestibility. 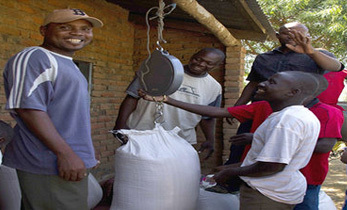 From traditional uses of sorghum for food, feed, starch and alcohol, the market demand is gradually shifting towards sorghum to be used as high-quality forage and as a health food. 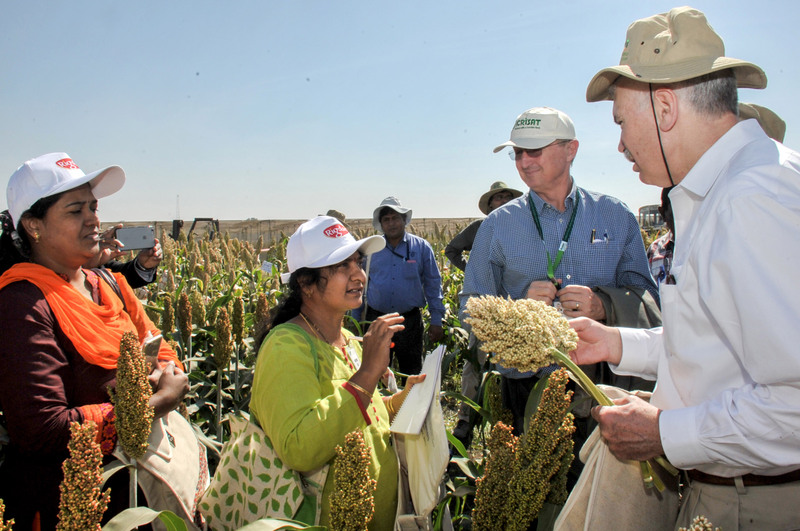 This was the key message at the Sorghum Scientists Field Day recently held at ICRISAT-India. At the plenary session, participants called for introducing new concepts in post-rainy sorghum parental lines and hybrids development. They recommended a greater focus on forage research, particularly single-cross forage hybrids with higher digestibility. 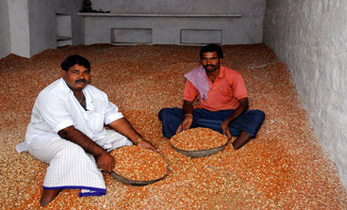 Representatives from the processing industry requested a supply of high-Zn sorghum lines from ICRISAT for developing improved processed foods for various commercial end uses. 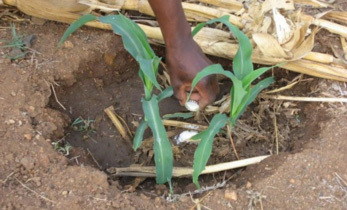 Participants also called for retaining the stover yield in genotypes of both rainy and post-rainy season sorghum while improving grain yields. 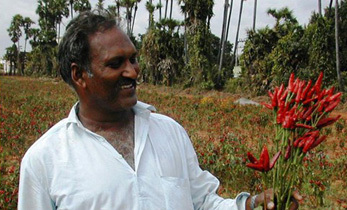 Dr Vilas A Tonapi, Director, Indian Institute of Millets Research, called for development of all-season hybrids to maximize sorghum adoption rates and crop productivity. Dr David Bergvinson, Director General, ICRISAT, urged the scientists to increase breeding efficiency in product development by sharing materials, best practices, locations and knowledge. He suggested that scientists migrate their data to the Breeding Management System for efficient storage and utilization. 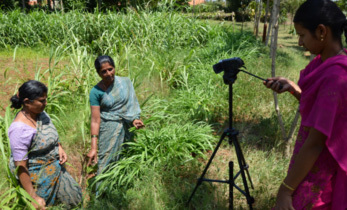 The field day was conducted under the aegis of the Sorghum Hybrid Parents Research Consortium (HPRC), which has been operational at ICRISAT for the past 17 years. HPRC partners with private sector seed companies in hybrid cultivar development, seed production and marketing of hybrid seeds. Ten companies from Asia, Africa and South America are currently members of the consortium. The Sorghum Scientists Field Day was held on 20-21 February at ICRISAT-India and was attended by 72 members. 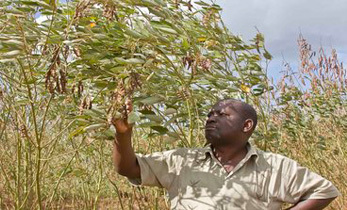 Participants at the field day included 25 members from the public sector, 20 from private sector (including a breeder from Seed Co Limited, the largest seed company in Africa), seven researchers from various ICRISAT-Africa locations, a five-member high-level delegation from Iran, and ICRISAT scientists. Dr Rob Bertram, Chief Scientist, Bureau of Food Security, United States Agency for International Development (USAID), and members of the Breeding Program Assessment Tool (BPAT) team – Dr Christopher Lambrides, Senior Research Fellow, University of Queensland; and Dr Yilma Kebede, Former Senior Program Officer, Bill & Melinda Gates Foundation, also attended the field day. The plenary session was co-chaired by Dr Belum VS Reddy, Principal Scientist (retired), ICRISAT, and Dr Sujay Rakshit, Principal Scientist, Indian Institute of Millets Research.